A caretaker already cured from Ebola is seen carrying a four day old baby suspected of having ebola, into a MSF supported Ebola Treatment Centre(ETC) in Butembo. The Ebola epidemic continues to spread through the Democratic Republic of Congo (DRC)’s North Kivu province with the city of Butembo and other isolated areas becoming the latest to be affected. About one million people live in Butembo. Other newest urban locations to be affected are Kalenguta, 25km to the north of Butembo city, and Katwa, 30km to its east. These places have all seen an increase in confirmed cases of Ebola as well as some resistance from the community. For now, the number of cases in Butembo’s city centre is low, but cases are rising quickly in its eastern suburbs and outlying isolated districts. So far, 440 people have been infected with the virus, 255 of whom have died. Teams from MSF continue to strengthen their efforts to help bring the epidemic under control through outreach activities to tackle community resistance as well as infection, prevention and control. Additional beds have been provided by MSF in the Ebola Treatment Centre (ETC) – with a current capacity of 64 beds. The outbreak declared on 1 August 2018, is DRC’s tenth and most serious epidemic of Ebola since the virus was discovered in 1976 near the Ebola River in what was then called Zaire. 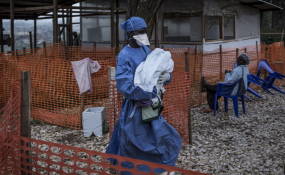 Forty years later, despite a massive and coordinated mobilization by the World Health Organization (WHO), the Congolese Ministry of Health and organizations such as MSF, the deadly virus is still spreading.